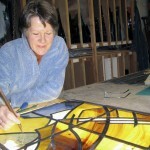 I live and work on the border of Herefordshire and Powys, using English handmade glass to create windows for churches, hospitals, libraries, schools, a ruined castle and many private houses. The colours, shapes, textures and light which find their way into designs and windows arise from the inspiration I find in the countryside which surrounds me. I have three raw materials: mouthblown coloured glass with all its character, depth and sparkle; lead, a heavy, strong yet tactile material which shapes, defines and energises a composition – and daylight, with all its subtlety and changes of mood. When working on commission, I am concerned with the style and function of a building, the thoughts and feelings of those who use it and with the context of the window: memorial, celebration, corporate vision and so on. At the same time, there must be space for my own style, symbols and influences. I enjoy the challenge of bringing together all these stimuli, in order to arrive at a meaningful end result. I particularly enjoy working within the context of the church, exploring great themes in new ways and, whenever possible, connecting the inside space with the outside. In this part of the world, that often means a beautiful churchyard. Through careful choice of colour and use of light within the design, something of the surrounding space can be brought into the building. Examples of my work can be seen at Lyonshall, Yarpole, Little Dewchurch, Orcop, Cusop and Frome’s Hill in Herefordshire, Clunbury in Shropshire, Astley, Hampton and Cropthorne in Worcestershire, Newent in Gloucestershire – and at Priston in North Somerset. I also love the chance to work in secular spaces, where I can sometimes explore my own ideas in a more playful and experimental way. written permission from the site owner. Copyright © 2019 Nicola Hopwood Stained Glass. Powered by WordPress. Theme: Spacious by ThemeGrill.